To co-assemble or not to co-assemble? Recovering genomes from metagenomes has become a powerful tool for microbial ecologists. Here we will assemble a metagenome, and go through the process of “binning” our assembled contigs into groups based on coverage and sequence composition using the analysis and visualization platform anvi’o. NOTE: Even the highest quality genomes recovered from metagenomes are not the same as isolate genomes. It depends on the data and assembly, but in general they are more of an agglomeration of very closely related organisms from the sample due to the assembly process and fine-scale variation that exists in microbial populations. They are being more frequently referred to as “metagenome-assembled genomes”, or MAGs, to better convey this. Boot an m1.medium Jetstream instance and log in. This time when you login, however, you need to provide an additional argument. We’re adding -L 8080:localhost:8080 because later that will enable us to run the interactive visualization on our local computers from the cloud instance. So your login would look like this, but putting in your appropriate user name and IP address in place of the x’s. “Co-assembly” refers to performing an assembly where the input files would be reads from multiple samples. This is in contrast to doing an independent assembly for each sample, where the input for each would be just the reads from that individual sample. Three major benefits of co-assembly include: 1) higher read depth (this can allow you to have a more robust assembly that captures more of the diversity in your system, but not always); 2) it facilitates the comparison across samples by giving you one reference assembly to use for all; and 3) it can substantially improve your ability to recover genomes from metagenomes due to the awesome power of differential coverage (you can download a slide showing how coverage is used to do this from here -> keynote, powerpoint). Though a co-assembly has its benefits, it will not be ideal in all circumstances. And as with most things in bioinformatics, there are no golden rules as for when it would be better to co-assemble multiple samples together over when it would be better to run individual assemblies on each. It could depend on many factors (e.g. variation between the samples, diversity of the communities, the assembler(s) you’re trying, you’re overall questions, who knows how many others things?, etc. ), and there can be datasets where a co-assembly would give you a poorer output assembly than an individual assembly would. So it is something you should consider with each dataset you work with, and if you are unsure and have the time/resources, then trying and assessing the outcome is always good practice. > finally we redirect the final output to a file names “samples.txt”. Check out the contents with cat samples.txt. And now we’re ready to get to work! Above, we briefly touched on some plusses and minuses of co-assembly vs individual-sample assembly. Here we are working with 4 samples from an enrichment culture, and the communities should be pretty well constrained - certainly relative to complex environmental samples like, say, a transect across soil. That would be harder to decide, but for us, it’s a pretty safe start to go with a co-assembly. There are many assemblers out there, and the reason each has a paper showing how it beats others is because every dataset is different. Some assemblers work better for some datasets, and others work better for others. That’s not to say all are magically equally good in every sense, but most that gather a following will out-perform all others under certain conditions. I typically try several (some well-known assemblers include SPAdes, Megahit, idba-ud, Minia), and compare them with QUAST (for individual genome assembly) or MetaQUAST (for metagenome assemblies). Choosing the “best” assembly is not straightforward and it can depend on what you’re doing, there is some more on that here if you’re interested, along with an example of testing assemblies/options and comparing them. In this case, here is how the command would be run with the Megahit assembler. But even with the smaller dataset we’re using, this takes about 40+ minutes on our cloud instances using 4 cpus. So rather than running this, we’re just going to look at the command and then pull the assembly output file from our results directory. -1 is for specifying the forward reads. Since we are doing a co-assembly of multiple samples, we could have stuck them altogether first into one file, but megahit allows multiple samples to be added at once. Notice here we are specifying all the forward reads in a list, each separated by a comma, with no spaces. This is because spaces are important to the command-line’s interpretation, whereas commas don’t interfere with how it is interpreting the command and the information gets to megahit successfully. -2 contains all the reverse read files, separated by commas, in the same order. If you glance at this file, with head final.contigs.fa for example, you can see there are spaces and some other special characters in the headers (the lines that start with “>”). This can be problematic for some tools, and it’s better to have simplified headers if you can. There are lots of ways to make modifications like that, and some scripts already exist. Anvi’o happens to have one, so we’re just going to use that here. We’re also going to filter out any contigs that are shorter than 1,000 bps. Whether you’d want to do this normally or not is up to the researcher, but that is roughly the average size of a bacterial gene, and the smaller contigs become the more difficult it becomes to get useful information out of them. Among other things (like enabling variant detection), mapping our reads for each sample to the co-assembly they built gives us “coverage” information for each contig in each sample, which as discussed above will help us with our efforts to recover metagenome-assembled genomes (MAGs). Code breakdown: The special words of the loop are for, in, do, and done. within this block between the special words do and done, each line is the same as the commands run individually above on a single sample. Only here, everytime we want to specify where the sample names would change is where we put “$sample”. The $ tells the command line to “interpret” the word “sample”, and since we made “sample” our variable name at the start of the loop (“for sample in …”), that will change each iteration to a different sample name and provide the correct input and output files for each command. Anvi’o is a powerful analysis and visualization tool that provides extensive functionality for exploring all kinds of ‘omics datasets. Here we are going to use it to visualize our metagenome and coverage from each sample, to help us see how recovering “genomes” from metagenomes works. 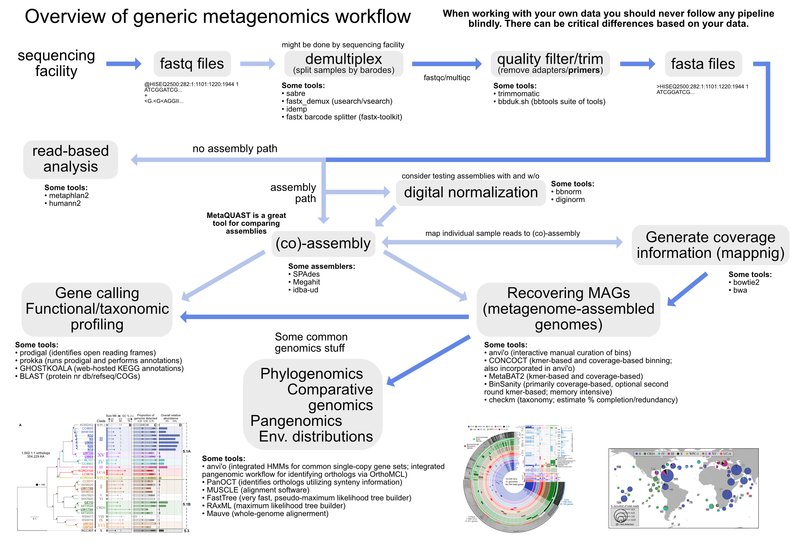 A much more detailed anvi’o metagenomics tutorial can be found here which starts from where we are (having our assembly fasta file and our sample bam files), and in general there are many tutorials and blogs at the merenlab.org site with lots of useful information for those interested in bioinformatics. The heart of Anvi’o when used for metagenomics is what’s known as the “contigs database”. This holds the contigs from our co-assembly and information about them. What information, you ask? All kinds! And lots of it will be generated over the next few steps. # anvi-gen-contigs-database -f contigs.fa -o contigs.db -n "my metagenome"
anvi-gen-contigs-database is the main program we’re using. All anvi’o programs start with “anvi-“, so if you type anvi- and press tab twice, you can see a list of all that are available (and most, if not all, have a help menu if you enter the command followed by --help). This step at the start is doing a few things: 1) calculating tetranucleotide frequencies for each contig (uses 4-mers by default but this can be changed); 2) identifies open-reading frames (“genes”) with prodigal; and 3) splits long contigs into segments of roughly 20,000 bps (though does not break genes apart) – this splitting of contigs helps with a few things like visualization and spotting anomalous coverage patters (we’ll see how anvi’o helps us visualize coverage below). Using the program HMMER to scan for a commonly used set of bacterial single-copy genes (from Campbell et al. 2013). This will help us estimate genome completeness/redundancy in real-time as we work on binning our contigs below (this should only take ~3 minutes). NOTE: See the bottom of page 7 of the HMMER manual here for a great explanation of what exactly a “hidden Markov model” is in the realm of sequence data. -p specifies which type of input we are giving anvi’o. Since we can import taxonomy information to anvi’o provided from many different tools, how you get it into anvi’o can vary. In some cases tools are used frequently enough that anvi’o has built in to it a way to read the outputs. That is the case with centrifuge. Ok, now that our contigs database has all kinds of information about our co-assembly contigs, we are now going to provide information about each of our samples to anvi’o so it can then integrate everything together for us. Each sample will have what’s known as a “profile database” that will keep information about that sample – like how many reads mapped to each contig and where. This step is surprisingly fast for all that it’s doing, but it would still take about 25+ minutes on our cloud instance. So we’re going to skip running these, but take a look at how it would be done. the first positional argument (no flag) specifies the sample-specific input profile databases. For each sample, when we ran anvi-profile above, the output created a subdirectory of results. By providing the * wildcard here followed by a /PROFILE.db we are providing all of them as inputs to this command. Ok! Now the payoff for all that hard work we just did. We are going to launch anvi-interactive which allows us to see our metagenome and how each sample’s reads recruited to it. This is why we had to sign in a little differently, to be able to host the website we are going to interact with so that we could get to it from our local computer. So there is a lot going on here at first glance, especially if you’re not yet familiar with how anvi’o organizes things. The interactive interface is extraordinarily expansive and I’d suggest reading about it here and here to start digging into it some more when you can, but here’s a quick crash course. At the center of the figure is a hierarchical clustering of the contigs from our co-assembly (here clustered based on tetranucleotide frequency and coverage). So each tip (leaf) of the central clustering represents a contig (or a fragment of a contig as those longer than 20,000 bps are split into pieces of ~20,000 bps as mentioned above). Then radiating out from the center are layers of information (“Parent”, “Taxonomy”, “Length”, “GC”), with each layer displaying information for each corresponding contig (leaf/tip). Beyond those, we get to our samples. For each sample layer, the visualization is showing the read coverage for that sample to each contig as you travel around the circle. Your colors will probably be different, but that doesn’t matter. Try to find the cluster of contigs that represents Trichodesmium. If you click on the “Bins” tab at the top left, and then select the branch on the tree at the center that holds all the Trichodesmium contigs, you will see a real-time estimate of % completion/redundancy. And we can see in the left pane that we selected 435 splits (contigs and/or split contigs due to length), with a total length of 6.87 Mbps, with an estimated 98.6% completion and 3.6% redundancy – remember estimated percent completion and redundancy comes from the bacterial single-copy genes we scanned for with anvi-run-hmms above. (This is pretty good, but Trichodesmium has a very strange genome for a prokaryote with a lot of long, repetitive regions that don’t assemble well, so we’re actually about 1 Mbps short of what would be expected.) As mentioned above, to shrink the dataset to make it more manageable most of the Trichodesmium reads have been removed, which is why the coverage patterns across the samples for Trichodesmium look strange, so don’t pay too much attention to that. Let’s move on. In the panel to the left, click “New bin”, and let’s look at some of these other clusters of contigs. Try to find the Alteromonas cluster, and then select the branch that holds it. Note across the samples (the rows wrapping around the circle), the coverage of these contigs varies, but that within a sample it is pretty consistent across these selected contigs. Meaning, Sample B seems to have the highest coverage for these contigs, but evenly across, and Sample C seems to have the lowest, but again consistent within that sample. This is what we would expect the coverage to do if these contigs all came from a similar source, and that source as a whole was in a different abundance in different samples. It seems the gene underlying the drop extreme drop in coverage across all samples was annotated as a site-specific recombinase. I don’t know much about these, but apparently they can be involved with recombination or DNA rearrangements. Maybe this was an artifact of assembly and shouldn’t be a part of our bin here. 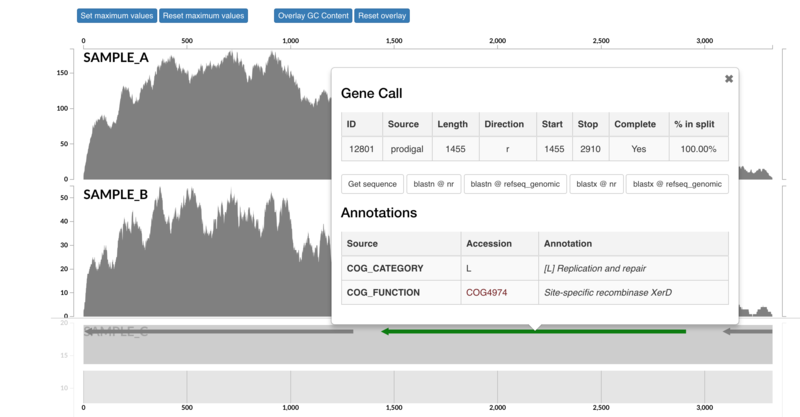 If you select “Get sequence” from the gene window, you can quickly go to NCBI and blast it if you’re curious. Running a BLASTX reveals the top hit as Phaeodactylibacter xiamenensis, which is what this bin actually comes from in this case (that’s known from further work not included here). But this sort of interface is where you could do meticulous manual curation of bins you were recovering by looking at things like coverage across samples. After a few seconds it will finish, and you can click the link to explore an html document summarizing things. When you’re done you can close the browser window and go back to your terminal controlling the cloud instance. © Copyright 2010 onwards, C. Titus Brown et al.. Created using Sphinx.